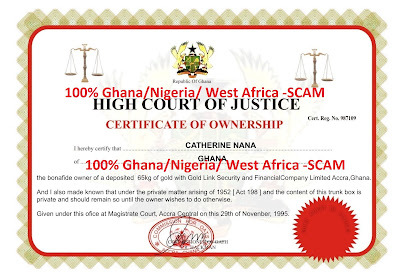 Nana Kofi Ansah, also known as Nana Kwesi Ansah, Managing Director of Golden Age Company, who is suspected of being a key member of a gold scam syndicate operating in the country, has been arrested. Nana Ansah is alleged to have swindled Mr. Todd Siegmeister, Managing Director of Crown Financial Solution Limited of the USA, of $500,000 and GH¢30,000 under the pretext of supplying and exporting gold to the USA for him. He was arrested by a crack team of security agents at Top Town, a suburb of Kasoa Amanfrom near Accra, where his office and residence are located on January 6, this year. Highly placed security source told The Enquirer Nana Ansah went into hiding after collecting the said amount from Mr. Siegmeister in November 2010, and efforts to arrest him proved futile. The source said that Nana Ansah provided his victim with Airway Bill and Customs Excise and Preventive Service documents, including tracking certificate, all dated January 6, 2011, but failed to supply any gold. According to the source, Nana Ansah in the course of swindling Mr. Siegmeister took some people suspected to be part of the syndicate dressed in CEPS uniform to him to convince him that he was dealing with the right people. The source said that Nana Ansah has so far admitted collecting the said money and investigations are still going on to arrest other members of the syndicate. Great information thanks for sharing this with us.In fact in all posts of this blog their is something to learn . your work is very good and i appreciate your work and hopping for some more informative posts . Again thanks. For more information about Web Designing or Cash for Cars visit website.